Anyone who has ever hopped in the car for a cross-state or cross-country road trip will find familiarity in the images in Neil Shepard’s latest effort, Vermont Exit Ramps. The poems feature rumbling construction vehicles, ATMs, quaint art galleries, and other staples of small town America. However, what moves the poems beyond the familiar is thepersonal and state history Shepard included. Like a passenger riding shotgun, the reader is invited along for a wonderful ride that is engaging, informative, and entertaining. 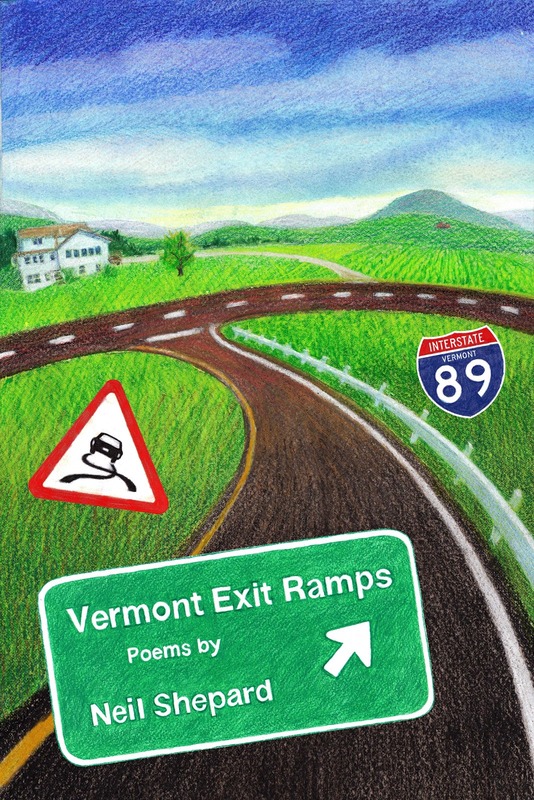 Set along the I-89 and I-91 exit ramps in Vermont, Shepard’s poems take several surprising and interesting turns, often veering into the state’s rich history.In the poem “I-89 Stowe/Waterbury (Exit 10:Route 100),” the poet begins with common highway images, including noisy construction machines and sun-drained road workers whose sweat “drips into hot tar.” But a few lines later, the reader is confronted with images of history, including the Summit House, built at the beginning of the Civil War, and the Big Hotel, which burned in 1899. These references serve as a fine reminder of what existed long before construction ever began on the Best Western Café Grill, Blush Hill Country Club, and theStowe Street Emporiummentioned in the poem’s final lines. In another poem, “I-89 South Barre (Exit 6: Routes 63 to 14),”Shepard digs deep by referencing the town’s granite industry and history of travel. The historical references are triggered by the image of a flatbed hauling away an old stagecoach, which causes the speaker to recall the year 1810, when everyone was poor and labored in the saw mill, grist mill, when everything moved by wagon, until a full century passed and the railroad allowed granite to be shipped faster from the town, lessening the starvation and poverty. Like much of the book, the poem successfully begins in the present, before shifting to the past to illustrate how the past shaped the community’s present condition. it was the driver who must have suffered most. The mother’s graciousness, kindness, and love resemble Robert Hayden’s much-anthologized poem “Those Winter Sundays,” which depicts a father’s love for his son. Shepard even repeats Hayden’s second to last line in the poem, “what did I know, what did I know,” a point in both poems where the speakers finally understand a parent’s love. Like the content of the poems, the form changes throughout the collection. At some points, Shepard employs short stanzas, tight lines, and frequent enjambment, while a few pages later he uses long rhythms and lines that echo Ginsberg or Whitman, two poets that were just as comfortable addressing the notion of American progress, or lack of it. Furthermore, Shepard’s frequent references to American consumerism, including ATMs, Best Westerns, and fast food restaurants, reminded me of Ginsberg’s frequent critique of consumerism, especially in his most well-known poem, “Howl.” Sheparddoes make several references to nature’s striking beauty, however, despite the highways and buildings we’ve constructed through much of the country. By the end of the book, the reader has a greater sense of Vermont’s rich history. The poet’s research paid off because it makes the collection layered and rich in detail. Like any good road trip, Vermont Exit Ramps leaves the reader feeling fulfilled and enlightened. Brian Fanelli’s poems have most recently appeared in Red Rock Review, Harpur Palate, Inkwell, Boston Literary Magazine, Portland Review, and elsewhere. He is the author of one chapbook, Front Man, and his first full-length collection will be published in 2013 through Unbound Content. Currently, he lives in Pennsylvania and teaches at Keystone College.